Introducing children to letters doesn’t have to only use print material especially for the very young. Children learn with all their senses and it’s best to teach them using as many as we can. These simple but valuable introductory activities is what this series Alphabet For Starters is all about. 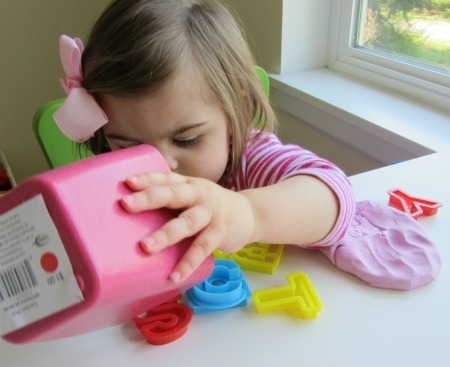 My daughter who just starting to show interest in letters loved this simple sensory activity. 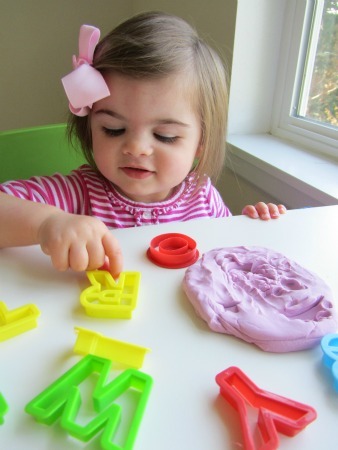 We played and played naming letters as we pressed them into the squishy playdough. Try to avoid using this time to quiz your child on their knowledge ( I know it’s hard not to ) instead label what they are doing. Gather your materials. 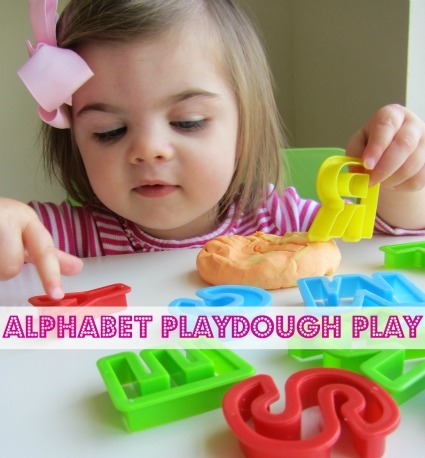 You will need some playdough ( we have great playdough recipes and even a gluten free playdough recipe) and alphabet cookie cutters. When starting any activity with a toddler I like to start them ready to play. 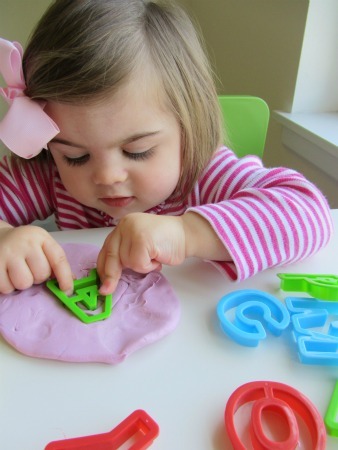 I gave her a few letters to start and a hunk of playdough pressed flat. She started playing and naming letters immediately. She knows a handful of letters but all the ones she doesn’t are named R . I don’t tell her ” NO it’s T! This is T!” I just say something like ” You are pressing the letter T so hard into the playdough.” or ” Look at that yellow T you have.” There is no rush – just play with the letters. I was shocked with how long she played – it just went on and on! We grabbed more letters from the bin. I asked her which letters she liked and even though she said A and M she played with R way more than any other letter. It was fun to watch her explore knowing that in an instant she will be reading and writing like her brother. 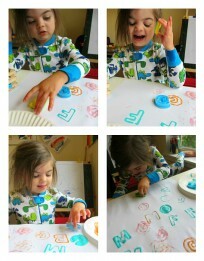 Savoring these simple playdough activities is such a treat. Like this activity but you have an older sibling who wants to play too? 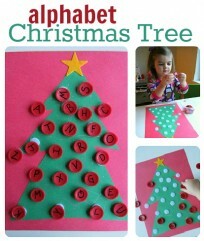 Or a child who is already familiar with the alphabet? Use the cookie cutters to cut out the letters of their names. Give them words to cut out and spell. 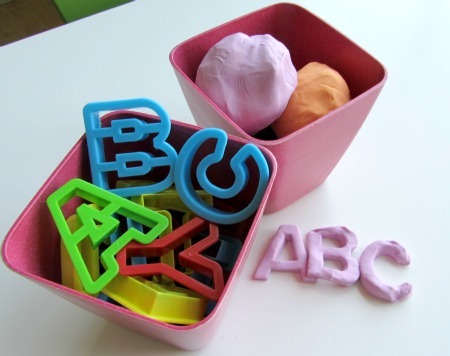 Guess how many letters they can fit in one hunk of playdough without overlapping the prints. I love those alphabet cookie cutters! Would you mind sharing where you found those? Thanks! Micheal’s too – they were really reasonable . I found mine at Michaels. We just had these out today in my preschool classroom. The kids like to play with them and it is nice to use them in a no pressure kind of way, with no quizzing. I so need to pull out my cookie cutters! Great idea! Did this today with my son and daughter and we had a lot of fun! My daughter is only 16 months, so not really into letters yet, but she loved playing with the cookie cutters and playdoh while I labeled what she was doing. Love this series! I need some plastic cookie cutters like yours. I only have metal ones and they are not that kid-friendly. That’s what I love about this is it can adjust so easily to their development. Oh and these cutters were super cheap too, metal ones I find can rust easily with playdough ( I’m guessing the salt in it ?) so plastic is great for playdough. 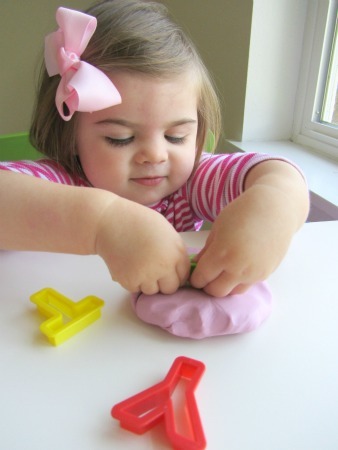 The pink play dough on this activity looks just too cute for words. Which of the gazillion recipes floating around did you use? Would love to get the same texture I see on the photo. How did you get that beautiful pink color? My food color does not give me the pink I see on your image. Duh! See Pinterest makes me forget that Play-Doh is even an option! Thanks Allison. On a hunt for baby pink Play-Doh. I see neon pink everywhere. 🙂 I think that is actually neon pink and white mixed well together. 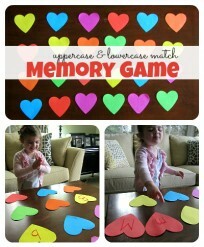 It looks a very good idea, and I can’t wait to play this with my little daughter! Perhaps when she was telling you the letters she liked she was actually telling you that she wants to go to A&M college when she is older.